It’s no secret that mobile is increasingly becoming the go-to device for consumers – whether that’s for communicating, consuming media, even online shopping. If current patterns continue, the data shows that 2019 will be the year when mobiles start capturing more time than all other devices combined. However, age is a pretty crucial factor here, with 16-24s expected to reach this landmark globally in the coming months. 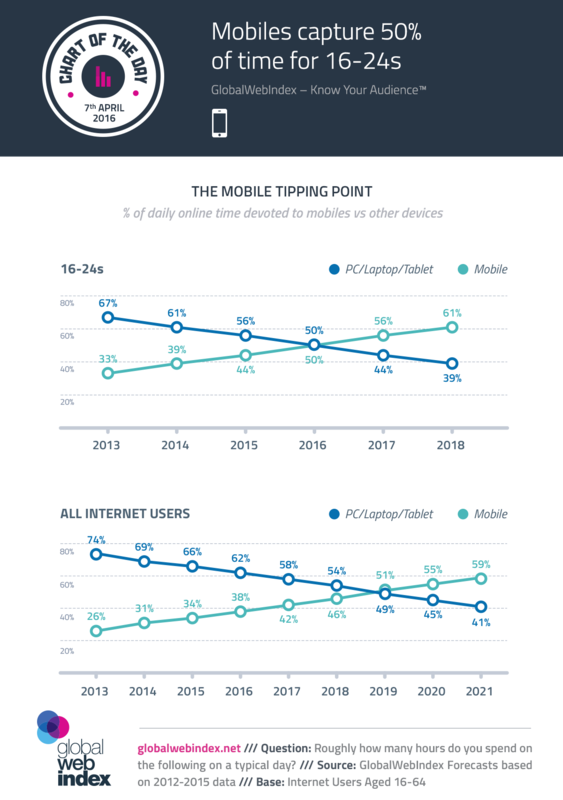 There’s similar variation by market; whereas many countries in regions like the Middle East and Latin America have already crossed the Mobile Tipping Point, many North American and European markets will not make this transition until the final stages of the 10s decade. As this happens, PCs/laptops certainly won’t be abandoned. Instead, we’re looking at the emergence of a bigger and bigger mobile-first audience – something which brings obvious implications for how and when brands will communicate with consumers.